Our brief for this garden was to create a classic style garden that would be in keeping with the surrounding landscaping and would stand the test of time and mature with the family who lives there. We chose the ‘Four Seasons’ theme as this would capture the romance and changing colours, scents and light of spring, summer, autumn and winter. When planning the garden our aim was to create a place that would seduce people in to this tranquil setting and away from the hustle and bustle of everyday life. It was very important to lay the garden out symmetrically so that each section could be enjoyed within its own right. We wanted it to contain plenty of colour and scents and encourage wildlife to capture the interest of visitors and be enjoyed the whole year through. It was also important to be easy to maintain to fit in with peoples busy lives. 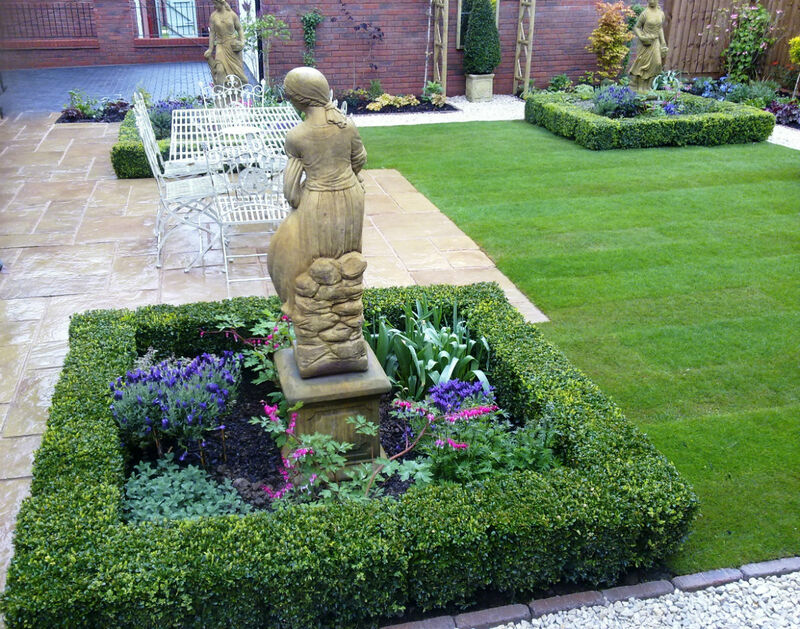 The garden is laid out in formal lines with repetitive patterns true to a classical styled garden, with features such as low square clipped box hedging, large attractive statues and carefully manicured topiary, all added to enhance this theme. The statues have each been strategically placed to give form and structure and can be admired from all angles of the garden whilst walking along the stone pathway. Each statue is surrounded by planting that reflects the mood of the season that it represents, with the clever use of mirrors and archways we were able to create the illusion of continuous walkways which created the sense of more space. We added a functional iron table and chairs along with a curved stone seating area to give the visitors to the garden somewhere to sit, relax and hopefully reflect and enjoy the many features of this wonderful garden.